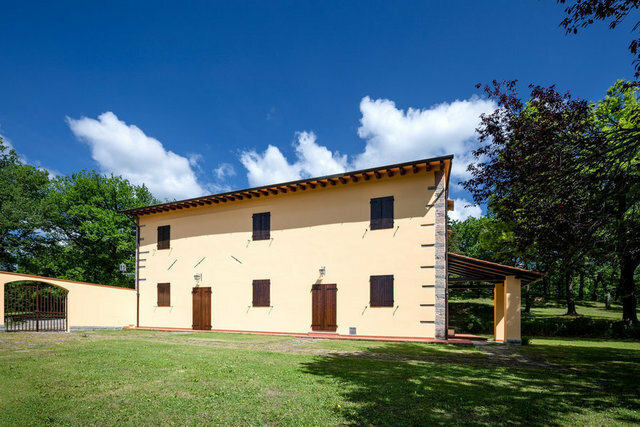 The charming property is located on the landscape of Mugello characterized by a wide array of mountains and hills that slope down to the flat area adjacent to the Sieve. The region of Mugello is famous for its homonymous international Autodromo, for the excellent food and wine offered by Trattoria's and local restaurants and especially for the wonderful landscape composed of olive groves, wheat fields, beech forests and chestnut trees. The villa, which presents itself in all its splendor, has undergone a skillful and attentive recovery to all its details. The manor house has intact the triple room with a splendid vaulted ceiling and adorned by two imposing columns in Pietra Serena stone that furnish the setting. The typical country kitchen is enormous and is directly connected to the dining room. The night area develops completely on the upper floor. The entire first floor is divided into 4 bedrooms with generous dimensions and 2 bathrooms, one being a master bathroom and a smaller service one. One also finds a convenient and useful storage room for storing various items. The location of the property is dominant and provides widespread views of the surrounding valley. In 15 minutes the motorway A/1 may be reached and Florence is only a 30 minute drive away, while Bologna is reached in a little less than an hour.